Dr. Loyd’s Fraction Kit is an easy-to-use, hands-on mathematics manipulative designed to unravel the mystery of fraction operations and explain how they really work. Inventor, Dr. Loyd is the author of numerous academic articles and books and a commercial mathematics readiness test. With over 37 years of experience teaching instructors, school teachers and students, he is a highly-qualified and respected national and international workshop presenter and has developed an engaging and successful method of fraction instruction. Instead of merely presenting a rule, The Fraction Kit employs the use of visual models to firmly establish the concepts of fractions and connect them to abstract, conventional symbols. These models teach children to visualize fractions without knowingly applying any given “rule”. This allows the fractions to become more concrete and not just a number on top of other numbers without meaning. The Fraction Kit includes 67 color-coded, transparent plastic pieces from whole square units to fifteenths. Students place one piece on top of another piece and one piece as a fraction of another piece to visualize the concept of a least common denominator and the four fraction operations: Addition, subtraction, multiplication and division. 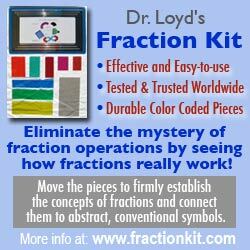 Unlike other fraction kits, Dr. Loyd’s Fraction Kit does not label the pieces. This allows students to develop fraction concepts prior to using symbolism rather than encouraging them to concentrate on manipulating digits. Currently used in over 2500 classrooms throughout the United States and worldwide, The Fraction Kit is also easily integrated into the homeschool setting. An added benefit of The Fraction Kit is that the heavy-duty, color-tinted transparent material can be used on its own or with overhead projectors to utilize cooperative grouping and small-group instruction. Dr. Loyd’s Fraction Kit is available in reasonably-priced single-student and classroom sets. Clear and concise Student Workbooks and Teacher Instruction Manuals are also available. Student Workbooks include step-by-step instruction and exercises. Field-tested Teacher Manuals provide guidance for teaching a variety of fraction concepts. Currently, Dr. Loyd is offering ahomeschool special which includes 1 Fraction Kit and manual and 1 Student Workbook. Whether your child is frustrated by fractions or learning fractions for the first time, Dr. Loyd’s Fraction Kit will help him/her to cultivate the confidence to master this usually daunting mathematical obstacle.